For the last several weeks, we have been reflecting on the Wedding Feast at Cana where Jesus performed His first miracle (Jn 2:1-11). He turned ordinary water into an overabundance of extraordinary wine. Wine symbolizes joy! Jesus wants you to know abundant and fruitful joy in your marriage. In the last three posts, we have looked at ways to receive the grace that Jesus wants to pour into your marriage. As we have mentioned in our previous posts, just as there were six stone jars at Cana, we propose that there are six “jars” which we need to fill with water (our efforts) so that Jesus can turn it into wine. In our work with couples, we find that prayer is difficult because of its deep intimacy, even more so than the marital embrace. In prayer, we are making ourselves vulnerable to our spouses and to God. Many fear this intimacy. However, praying together as a couple has been shown to be the leading indicator of happiness in marriage. Praying together as a couple is good for your marriage! Praying together and attending weekly Mass as a couple virtually divorce-proofs your marriage. 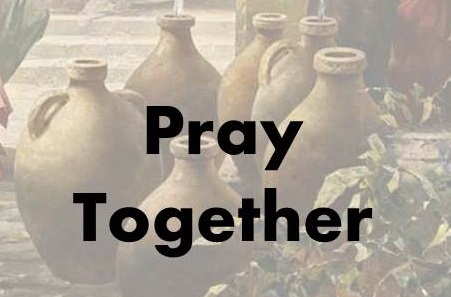 The goal of praying together is to grow closer to God and each other. 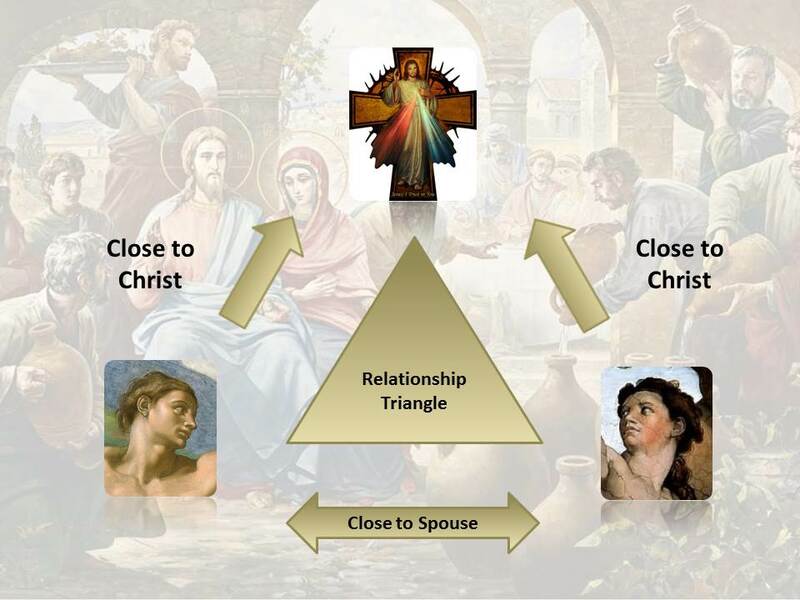 This illustration shows the relationship of the husband and wife to each other and to Christ. As the spouses pray together, not only do they grow closer to Christ, they naturally grow closer to each other. As you each move closer to Christ through prayer, scripture reading, and receiving the Eucharist, the distance between you shortens. A natural outcome is that the spouses move closer to each other in their relationship. Our Father/Hail Mary – Men take the lead by saying Our Father. Women respond with Hail Mary. Take turns thanking God and asking His help for your spouse. Rosary – Pray a mystery of the rosary together each day. Magnificat [Add link] – This monthly publication includes prayers for morning, evening and night, as well as the daily Mass readings. When we were dating, we used the Magnificat to pray together every morning by telephone. Now we pray it side-by-side every morning before Mass. Extemporaneous – Here each spouse alternates saying a short prayer of thanksgiving, praise or petition for each other’s needs. Pay attention during the day to struggles or needs of your spouse and present these to God in your evening prayer time. Give prayer a try and experience the wonderful transformation that it will make in your relationship with God and each other!